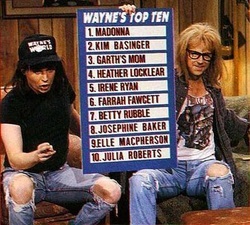 Wayne loves Top Ten lists. And so do I. These lists take a while to compile and you have to play and tinker with them. You are constantly rearranging to see how they fit together, like a tricky puzzle. They will take a while to grow, but are worth it in the end. Enjoy - and as always, if you disagree, tell me. You're probably right.